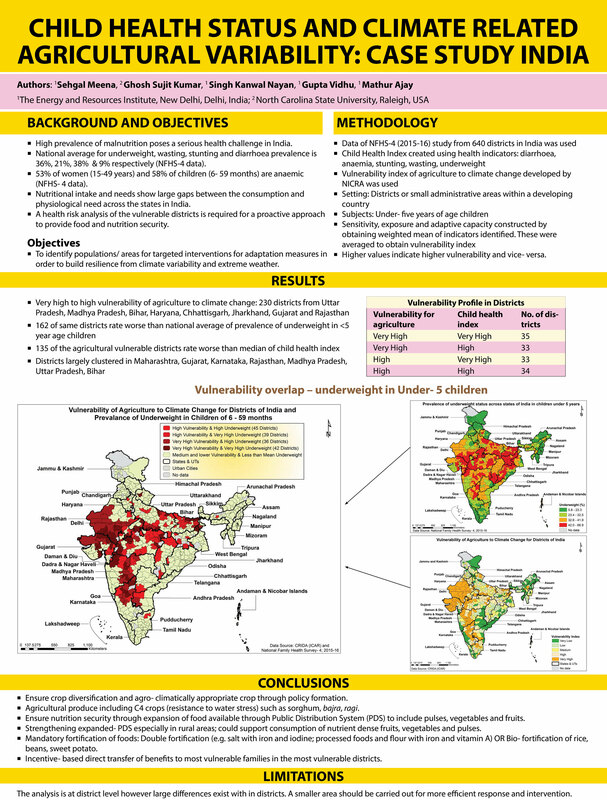 The poster was presented at 50th Annual National Conference of Nutrition Society of India (NSI), ICMR- National Institute of Nutrition (NIN), Hyderabad, India. High prevalence of malnutrition is a serious health challenge in India. There are nutritional gaps between consumption and physiological needs in India. Thus, there is a need to conduct a health risk analysis to identify populations to build resilience from climate variability and extreme weather. The data from NFHS-4 and vulnerability index of agriculture to climate change (developed by NICRA) was used. This was a district level analysis. The districts in Uttar Pradesh, Madhya Pradesh, Jharkhand, Bihar, Haryana, Chattisgarh, Gujarat and Rajasthan rate worse both for agricultural vulnerability to climate change and child health index. Therefore, measures like crop diversification; ensuring nutrition security through Public Distribution System and many such similar measures need to be adapted by these states in India.